The Crystal Ball Says. . .
Last night I went to an event called "Mystic Night" with some work friends. There were several psychics at the event that we could meet with. I've never met w/ a psychic before so I was really excited to see what they had to say. The first lady I met with was a tarot card reader. I walked into the room and she said, "Oh you're a little anemic." I was like wait what? She says it again and looks at my hands. I guess it was a nice way to tell me I'm pale and look like crap. Ha! She continues to go on with "You have low blood pressure right?" And actually I do but last time I checked my iron levels were fine. . . so she was 1/2 right. She told me to pull out 5 cards and not look at them. She turned them over and proceeded to "read" them. It was interesting and I think she was pretty accurate on some things. She said that she thought I had many good friends and was close to my family and spent too much time with them and therefore wasn't meeting single men! Ha! She told me I need to join a gym or sign up to play a sport. Clearly she didn't read me to well b/c I hate working out! She told me to think of a question and to pull 3 cards. Then I had to tell her my question and she answered it using the card. It was (of course) the answer I was hoping for. She also looked at my palms to answer this question. She read the lines and told me what they meant. It was interesting. I liked her and thought it was fun. 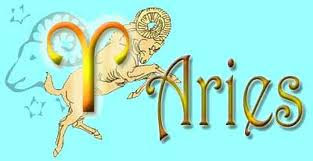 The next lady I met w/ was also a tarot card reader. She was just ok. Very generic info given and a lot of generalizations. "Do you have a brother?" I tell her yes and she proceeds to tell me all about him. Not sure which one she was talking about since I have 3 brothers! Guess she missed that! Ha! I kept hearing that this one specific lady was "really good" so I knew I had to see her. This woman asked me my birthday month, day and year then looked it up in a book. She proceeded to tell me a bunch of things based on astrology. It was really interesting. So she told me that my "storm" was going to last about another 1.5 years and then things would "settle." She said she sees me in a relationship with a nurse/EMT/chiropractor or a musician/artist and to "stay away from the alcoholics." Yeah great advice right! The best thing she told me was that money would become easier the older I get. Good news right! She asked if my family had money and/or if I was going to come into some family money - um no but I wish. She told me then that I was going to be partnered w/ someone w/ money. Ok! I'll take a rich husband! There was more but that was the basics of it. All and all a lot of fun. I take it all w/ a grain of salt. It was a fun night out and I'm glad we went! Have you ever been to a psychic? Did they tell you something good? This is the most elaborate, romantic, sweet, fun, loving proposal I have seen, maybe ever. It is worth the 8 minutes. Watch it. You will laugh. You will cry. This guy - Brad - gets major brownie points for this one! Would love to know if they have a blog!! Photos of. . . ME! A few weeks back I met up with a fellow Boston Blogger, Morgan, for a photo shoot. When Morgan offered to take free photos during the month of September I figured it was a great opportunity to get a nice photo to use at Fashion Plates next week. I love taking pictures and I love being in pictures BUT not alone. It is so awkward to pose alone right? Or is this just me? Honestly, I'm a very awkward poser so many of the photos I don't like because of the way I'm smiling, or the way I'm standing, or my hair. . . and the list goes on. I guess we are all a little critical of ourselves. Despite the fact that it was raining, Morgan took some beautiful photos and was really fun to work with. If you live in the Boston area I recommend you check her website out! Why do the weekends always go by so fast? The weather this weekend was gorgeous and I just wish it would stay this way for a few more weeks! Luckily I got outside to enjoy the warm and sunny days this weekend. My weekend started out with picking up my iPhone 5 (I had reserved one online the night before)! 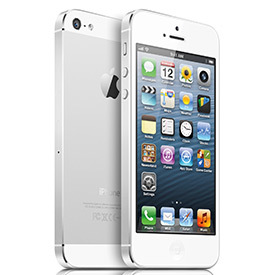 It is my first white iPhone. It is very pretty and much lighter than the previous iPhones! 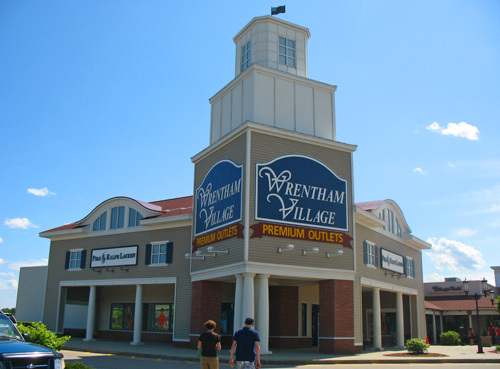 My bloggy friend who blogs over at Many Waters was is in town visiting her family so we were able to meet up at the Wrentham Village outlets on Saturday. I was very excited to meet her baby who is now 3 months old. She slept most of the time and let us shop but woke up at the end so that I could meet her. She is adorable! Oh and it must be recorded in writing. . . I did not buy anything! Shocking I know. I had to have self control since I had bought my new iPhone 5 that morning! I figured that was a big enough treat for the weekend. Saturday night I went to a wine tasting party at Kendall's house. The Traveling Vineyard company came to Kendall's house and provided everything. It was fabulous! We tasted 5 wines and out of the ones we tasted the Fissata BlondeMoscato was my favorite. I bought a bottle and look forward to drinking it! Check out this company and host a party! It was such a fun girls night in! Sunday morning Ilka, Sheryl and I went down to Ports and Company for our Fashion Plates fittings. Last year I went alone so I was excited to have some friends (and opinions) with me this year! When we arrived Erin was just finishing her fitting so we got to check out what she would be wearing on Nov 2nd too! Then we got to work. We all tried on a lot of different clothes. It was so fun to see what Ilka and Sheryl were trying on too. We all ended up with three beautiful outfits and I can't wait to see how they all come together at the show! 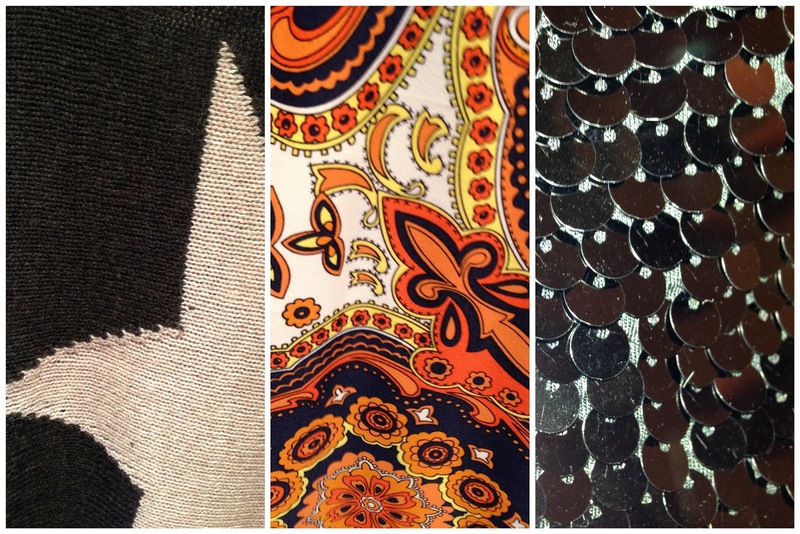 Here is a sneak peak at my three outfits in the order I'll be wearing them. . .
All I will say is that one of the outfits is something I would NEVER have picked out for myself or imagined myself wearing. But everyone loved it so I figured I'd go for it. Might as well go big or go home right!? Ha! All that shopping (yes we each bought something other than our Fashion Plates outfits which I'll share later this week) made us very hungry! 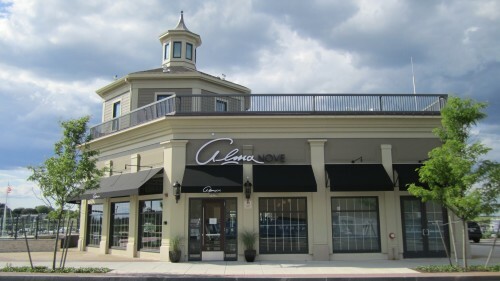 We went to Alma Nove in the Hingham Shipyard. I've been dying to try this restaurant as it is owned by Mark and Donny Wahlberg's brother Paul who is also the chef. It did not disappoint. The food was delicious. The setting is beautiful. I would love to go back for dinner and drinks at some point. We had such a nice afternoon together. I am very excited for Fashion Plates which is only 11 days away!! What did you do this weekend. Link up and tell me! P.S. I really wanted to go to the Head of the Charles this weekend but never made it with everything else going on. 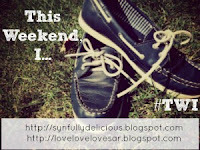 So if you went be sure to blog about it and tell me how it was! I am so happy that the work week is over. I thought it would never end. It was just one of "those" weeks at work. One difficult, sad, hard, stressful, etc case after the next. You seriously wouldn't believe me if I told you about some of my patients. It is just unreal. The stuff reality tv is made of. So to reward myself I decided to go and buy the iPhone 5 after work. I went to the "fancy" mall since it is only minutes away from where I'm babysitting tonight. When I pulled up I noticed that the fire alarm was going off and seconds later people starting pouring out of the mall. Then these arrived. 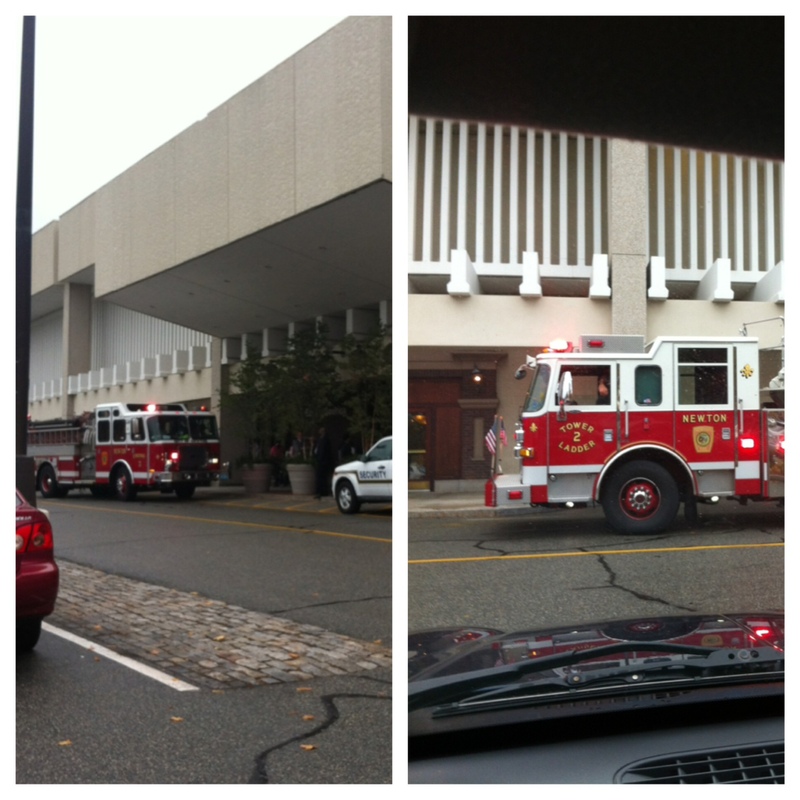 . .
Several fire engines pulled up and the firemen ran into the mall. I waited for a few minutes and before I knew it they were letting people back in. So in I went. . . unfortunately the Apple store did not have any phones. Boo! I guess I'll have to order one. I'm not taking either of those 2 things as signs that I shouldn't buy one. Haha! Just a delay in my plan. I ran across the street to CVS and there was another fire truck!!!! Seriously! Turns out these guys were just shopping. Love how they park right.in.front.of.the.store. I'm not parked on the couch with Sammy and Jake watching Tom and Jerry. 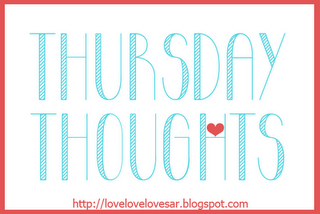 Is it really only Thursday? How I wish it were Friday already! I don't know about you but this week has been a tough one with many complicated cases at work. I'm SO ready for a fun and relaxing weekend! Yesterday was my brother Allan's birthday. We celebrated like we always do with a family dinner at my parent's house. Luckily Allan's birthday/favorite meal is the same as mine! Of course the highlight of the night for Peyton and Ella is blowing out the candles. Why is that so darn exciting for kids? If only we still got that excited about it! Yesterday I got dressed in this shirt that I bought at The Limited several weeks ago. After putting it on I realized that I had a necklace that matched it perfect and I didn't even buy them together. I love when that happens! I also love the color combo of these pinks and purples. Has anyone tried this product? It is advertised every morning on the radio station I listen to and Lisa endorses it. So I wonder. . . does it REALLY work? It is expensive but if it works then it would be so worth it. I figure there must be some bloggers out there who have tried it! 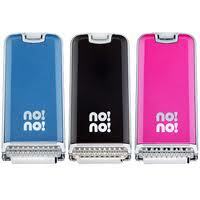 If I end up getting it I will have to write a review on my blog! I know there are SO many great recipes out there for apple crisp. There are a few I've used. I like this one b/c it is VERY simple and I typically have all the ingredients on hand which is a big plus when you get a craving! Fill a 9x13 baking dish with the peeled and sliced apples. Mix the water and cinnamon together and pour over apples. Mix the three topping ingredients together in a bowl and work it with your fingers until it is well blended. With your fingers still messy, crumble this topping all over the apples until it is all used. Bake at 400 degrees until the apples are down. The top should be a golden brown and crunchy. (I think I baked mine for about 20 to 30 minutes but I made a smaller portion than this). This weekend was very relaxing! I looked for a dog and have fallen in love with this beauty. . . 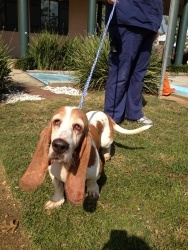 This is Dakota and she is available for adoption on Petfinder. I WANT her! She is currently living in New Orleans and I would gladly take a vacation there to pick her up. She is the cutest thing and I think she would be very happy living with me (too bad my condo association says no bueno). Not sure why I torture myself by looking for dogs when I can't have one right now. Plan is to move at end of this lease (in August) and find a new place that is dog friendly! On Saturday night I celebrated Cara's 40th birthday! Eleven of us went to dinner at 28 Degrees and then for drinks at City Bar. 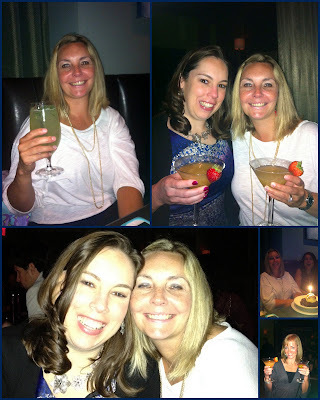 Cara had a great birthday and it was fun celebrating with her. I was the youngest of the group which was fun and different for me. It was funny hanging out with all married ladies who have 2 to 3 kids each! They all had to go home on the earlier side so they could get up with their kids the next morning. Not me! And it is a good thing. I was EXHAUSTED on Sunday. I haven't stayed out until 2 AM in a long time and now I remember why. I pretty much stayed in bed all day Sunday. Happy Birthday Cara! So glad I could help you celebrate! My lazy Sunday pretty much consisted of watching the Lifetime channel all day. They kept me entertained with several chick flicks (Spanglish, Made of Honor, Bride Wars). Oh and I stopped my gluten free eating (blame it on Cara's birthday dinner). There weren't any good gluten free options and I have no will power and needed to eat that delicious brownie dessert! So Sunday night my plan was to make apple crisp with the apples we picked on Thursday. But I never motivated to do it. So hopefully tonight! Hope y'all had a great weekend. A few other things I want to make sure you know about. . .
1. My work event "Cutting For A Cure" is one week from today. If you live in Mass and are interested in donating 10 inches or more of your hair let me know. You will get it cut and styled by the ladies at Halo Studio for FREE and it will be donated to Pink Heart Funds! Do something amazing for Breast Cancer Awareness Month! 2. 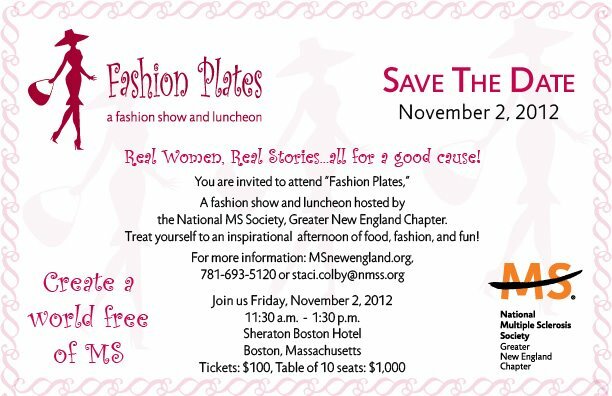 Fashion Plates is only 18 days away! There are still tickets available for my table. 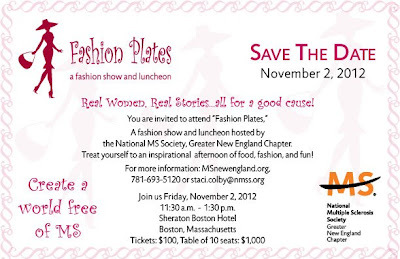 Come and cheer me on as I walk the runway for MS! 3. Today is the first day of the silent auction for Julee and Preslee. There are tons of amazing items to bid on. 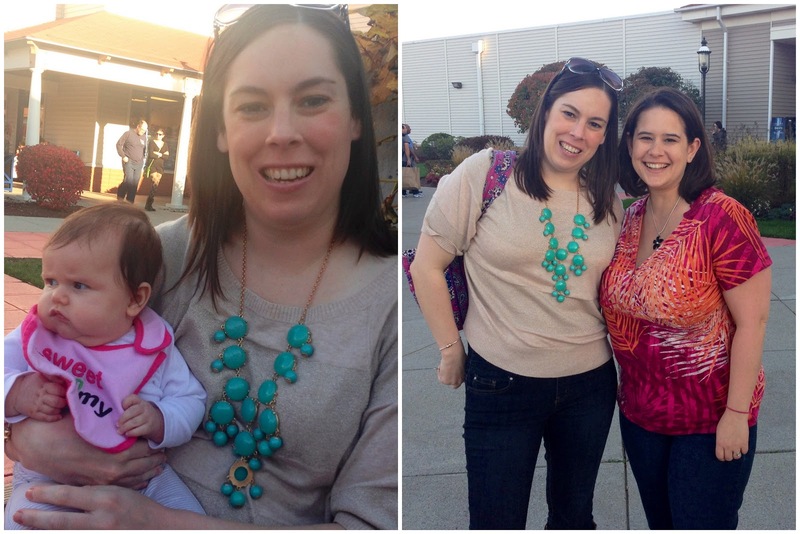 So many bloggers have come together to make this happen and it is awesome to see the support for Julee and her family. Go bid! 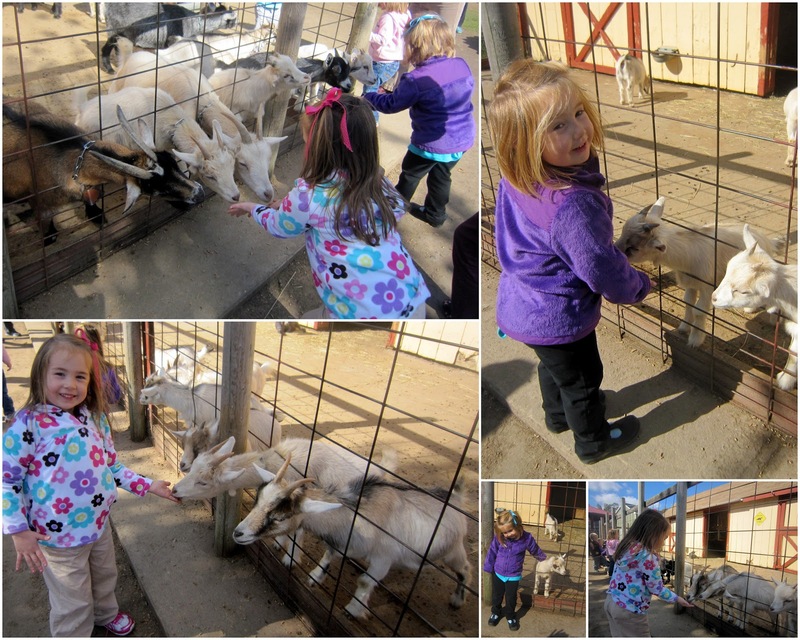 Apples and Pumpkins and Goats Oh My! 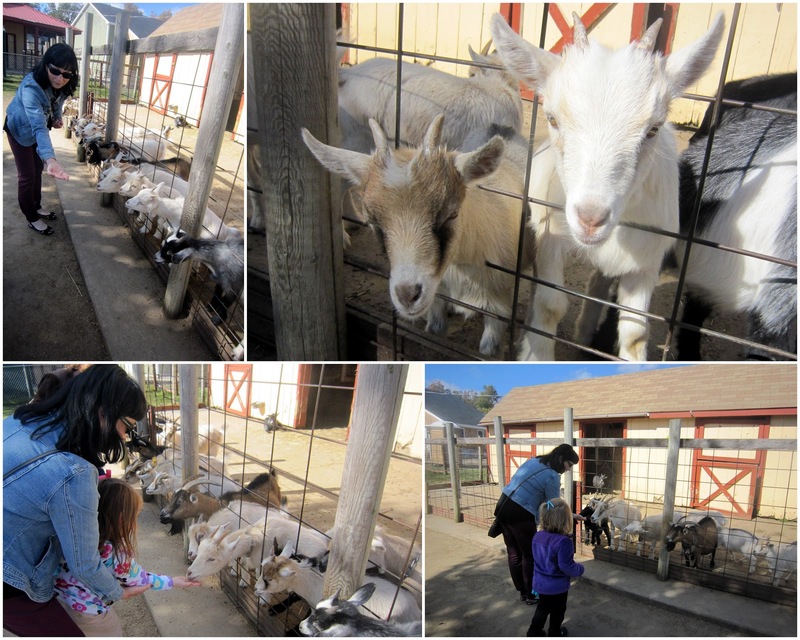 Yesterday I took a rare half day at work and met my mom, Peyton and Ella at Tougas Family Farm for an afternoon of apple picking, pumpkin sitting, goat feeding and cider donut eating. The weather was gorgeous and it was a wonderful afternoon. Get ready for the photo dump! The girls were VERY excited to be there! As you can probably tell. I told them to do their "crazy" pose and this is what I got! Ha! 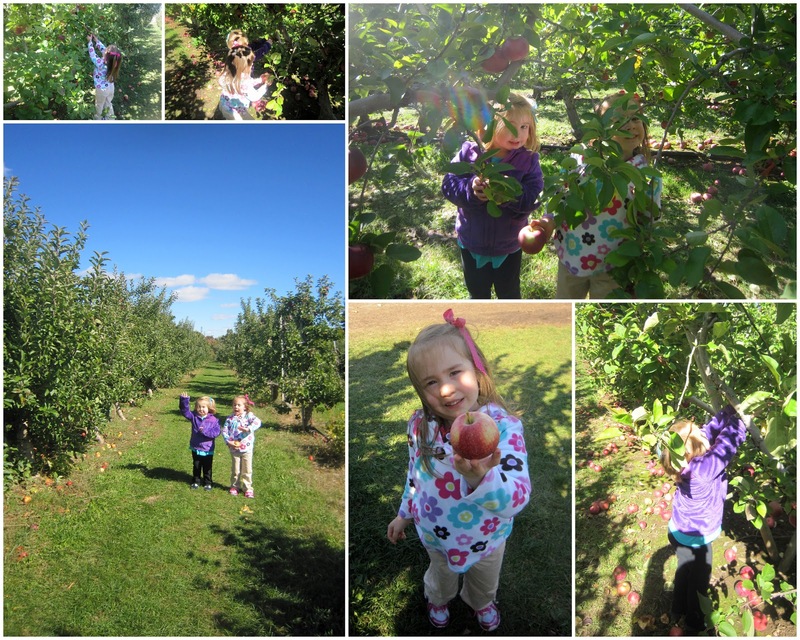 We pretty much had the apple orchard to ourselves which was really nice unfortunately there weren't a lot of low apples left. . . 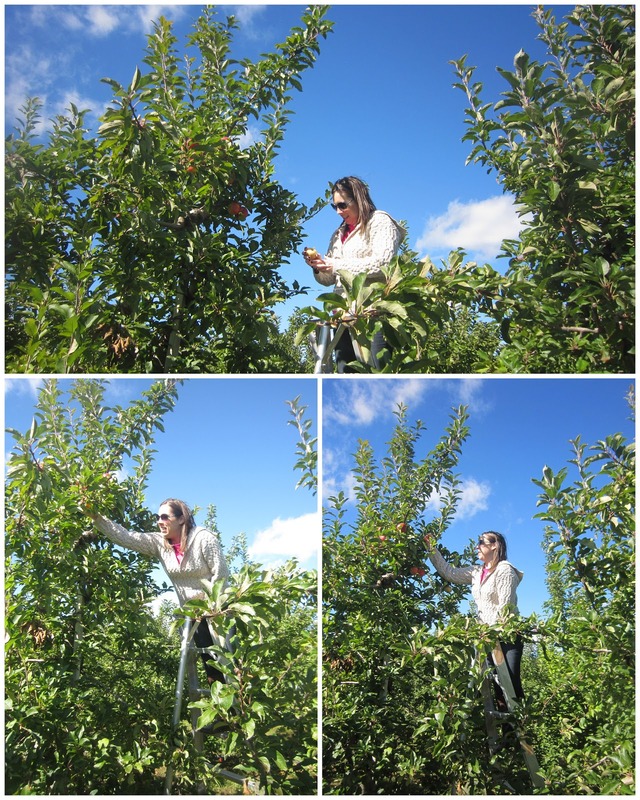 So I found a ladder to get some of the higher up apples and then. . . 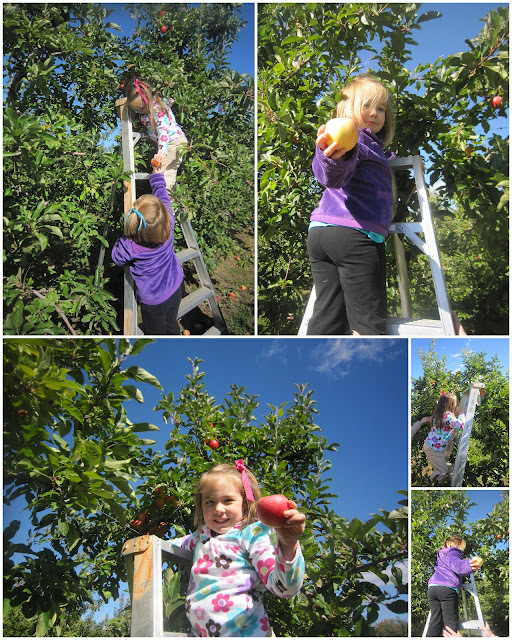 These 2 little monkeys wanted to climb the ladder too! Funny thing about apple picking is that it only take like oh 5 minutes to fill a big bag. Needless to say we were balancing apples on top of the bag and eating some on our way out! 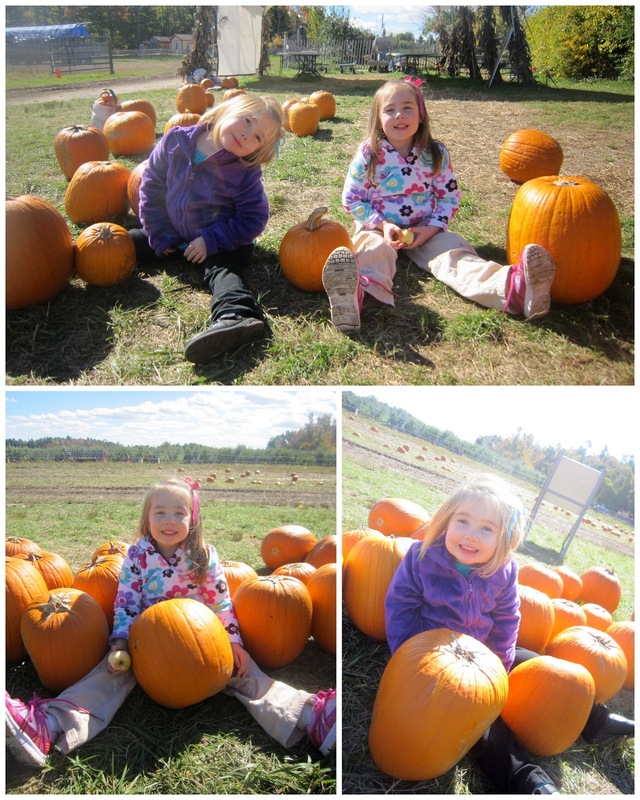 Next up was a visit with the pumpkins. 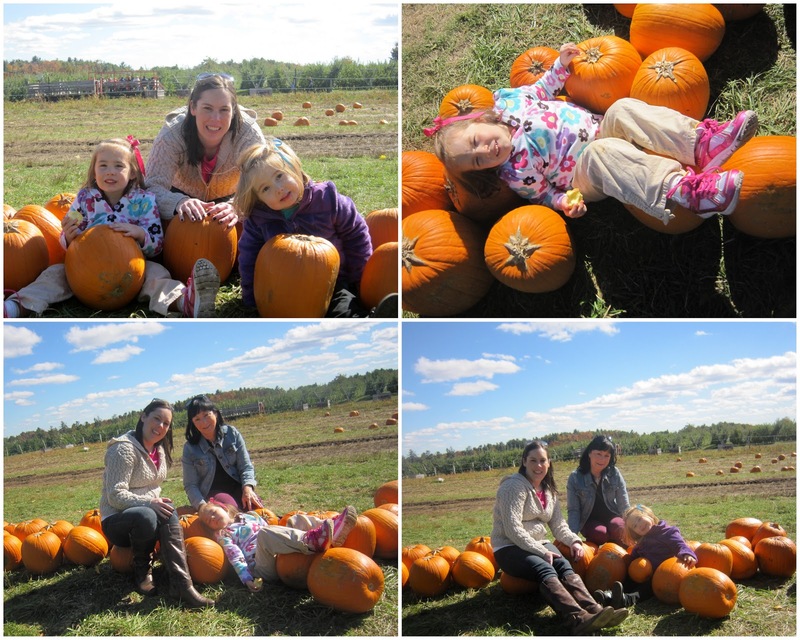 Peyton made a pumpkin "bed" and then both girls wanted to take turns of being the photographers! Next up were the goats. I LOVE goats. I just think they are so cute and fun. Peyton and Ella were a bit nervous at first but once they saw Grammy do it they were all set. They very quickly became VERY comfortable with the goats. I couldn't figure out why Ella always seemed to have so much food left. Then I discovered she was literally feeding the goats one piece of food at a time. When I told her to give them more she told me she didn't want them to get a stomach ache. This kid is too much! 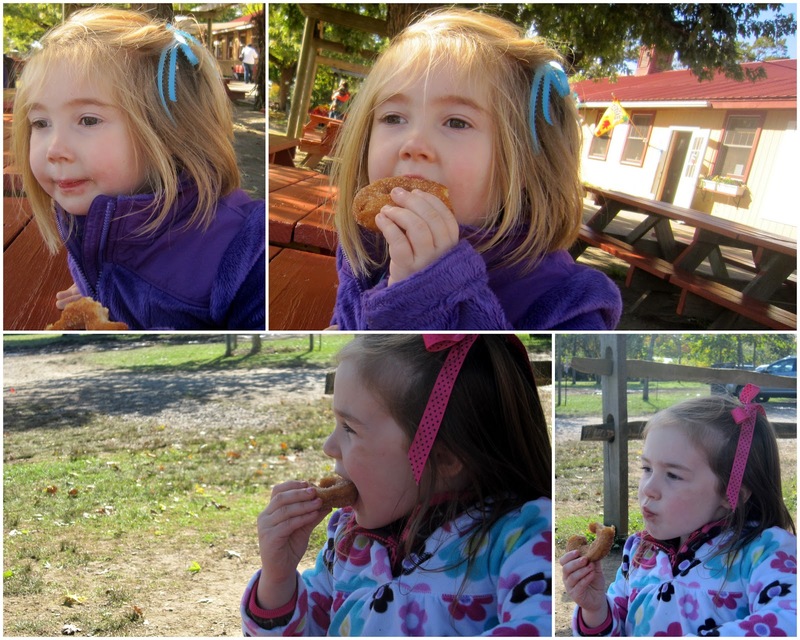 After the goats and a really good hand washing we enjoyed some cider donuts and cider. Yes I did cheat on my gluten free diet (which I'm about to give up on again anyways)! AND. . . just for fun a little THEN and NOW. . . 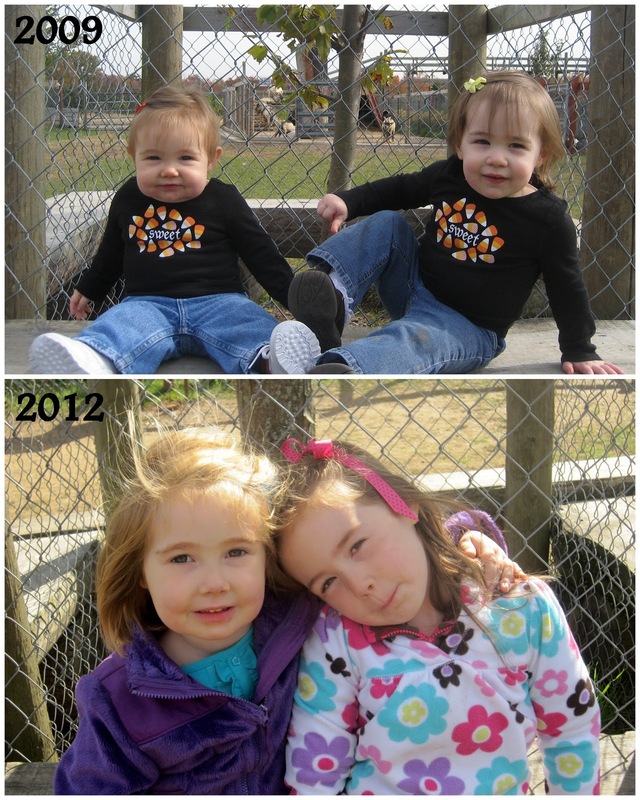 These two have grown up fast. It was just as much fun this time as it was back in 2009! Can't believe it took us this long to make it back there. We had a wonderful afternoon. Can't wait to do it all over again next year! Happy Thursday! This has seemed like a really long week to me. Anyone else? I'm in a good mood b/c I'm leaving work early today for a date with my mom, Peyton and Ella. We are going to an apple farm/pumpkin patch/etc. And yes I will be cheating on my gluten free diet in order to eat a cider donut. I HAVE to. I'm really looking forward to it! Hopefully I'll have time to blog tonight after my MAAV committee meeting. So check back for some adorable pictures of my nieces! Anyways on to other things. . .
Have you heard about The Piano Guys? I hadn't until I saw them on Katie. Have I mentioned how much I love that show!? Five guys from Utah making it big on the internet due to this unique talent! There are many people, who are not bloggers, who just don't "get" us. They don't understand the friendships with people we've never met, the support given and received, the tweeting/texting/emailing. . .
Well for all of you who don't "get" the blogging community I'm hear to tell you that THIS is why it is so amazing. 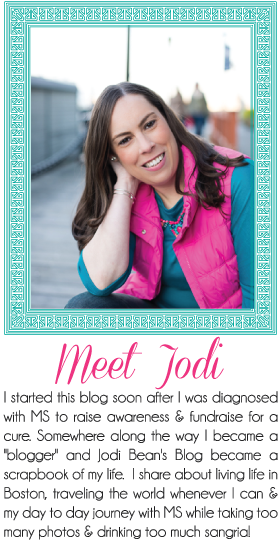 On Saturday night a fellow blogger, Julee, lost her husband, Matt, in a tragic car accident. The support for her that I have seen on blogs and twitter has been astounding. 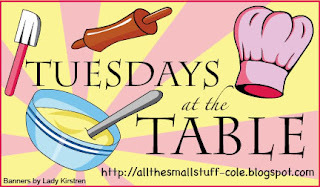 I have read Julee's blog for many years. I followed her journey to get pregnant with Preslee and was so happy for her and Matt when she announced it. I've enjoyed reading since too. Even though I don't "know" Julee in real life I feel like I do from reading her blog. I am so sad about what has happened. It just isn't fair. It is so amazing to see the blogging community come together to support her and Preslee. I'm honored to be a part of this community. Please do what you can to support Julee and Preslee during this difficult time. You can read about ways to help here, here and here (I'm sure there are other places too but this is what I've seen). I'm back to work today. Unfortunately I don't get Columbus Day as a holiday. Hope you are enjoying a long weekend! This weekend I finally booked my flight and rental car for Katie's wedding. I still can't believe I'm going to a fellow blogger's wedding who I've never met! I'm really looking forward to it and to visiting Elon and Elon friends. I haven't been back in such a long time. 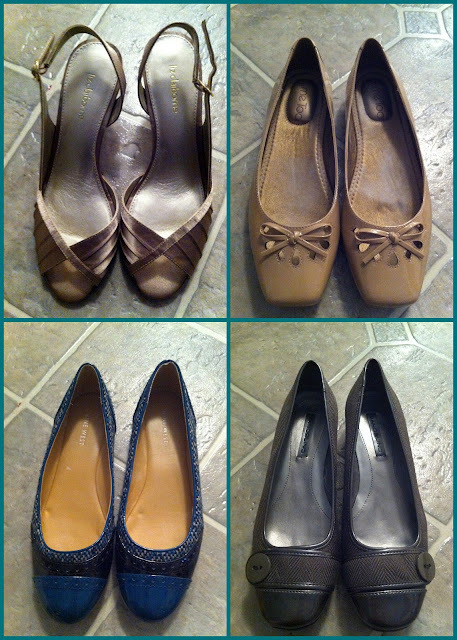 While I didn't plan on spending money on 4 pairs of shoes I was pretty happy to find some great buys! 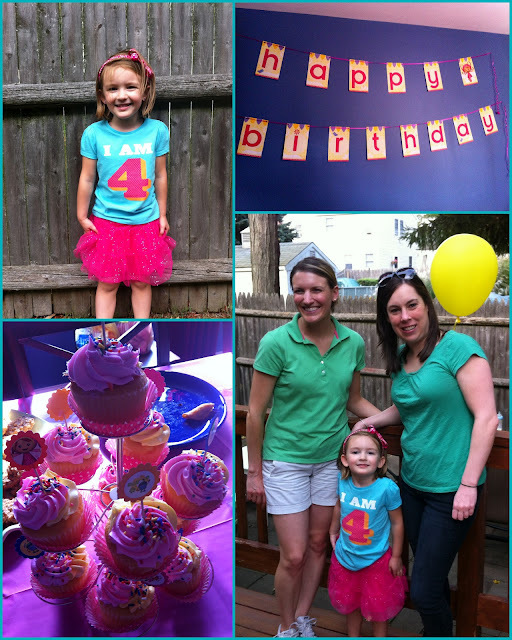 After the shoe buying extravaganza I made my way to Riley's 4th birthday party! Me: "Riley can I take your picture in your birthday outfit?" Riley: "Everyone wants to take my picture!" It was kind of like a few weeks ago when I told Riley I liked her new haircut and she said, "I know." Ha! I got Riley the best.birthday.gift.ever. 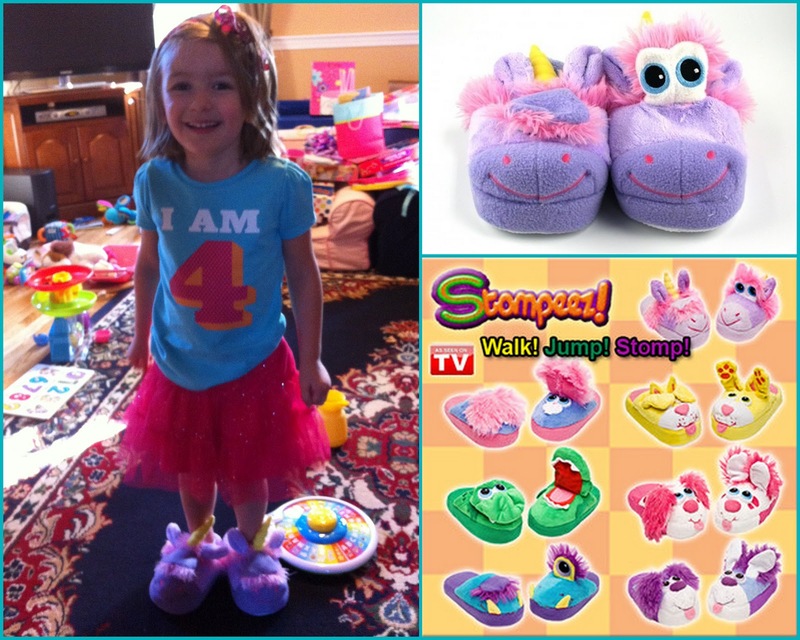 Stompeez! Have you seen them? Apparently they are the best slippers ever according to most 4 year olds! When I was shopping with Peyton last month (when she slept over) she saw these and went nuts. She had to have them. I told her she had to wait until her bday or xmas. I plan to buy them for both her and Ella. Anyways Riley also loved them. She was jumping around and showing everyone. Too cute! If you have a 4 year old in your life I highly recommend buying a pair of these silly slippers! Since I'm eating a gluten free diet right now and couldn't have any cake I had some wine instead. It will do. After the birthday party I met up with Joana for dinner. I love that Kendall and Joana now live in the same town. It makes seeing them both on the same day very easy! We had dinner and then had to try out this new froyo place. It was packed! The best thing is that they had a ton of gluten free toppings! Yum!! While we were in the froyo place is started pouring rain - needless to say we had to hang out a while and wait for it to pass. On Sunday I made my way to the Sowa Market b/c I knew a gluten free vendor would be there. I picked up some gluten free bread and a brownie. I walked around for a bit and checked out some of the other vendors. Then I made my way to the food trucks. Oh how I wish I could have had one of everything. . . but most of the foods had gluten so I settled for these fries. OMG they were the best fries ever. They had seasalt and rosemary on them and were so good! I will be visiting that food truck again in the future! This weekend I got my first pedicure since I walked 50 miles in 3 days. Only 9 of my toe nails got polished! I wonder when that toe nail will grow back?! 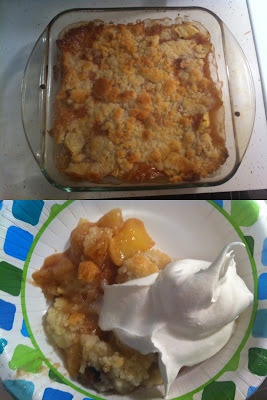 I made apple crisp without the crisp (gluten free treat). It was so good! So that was my weekend! Now it is back to work.